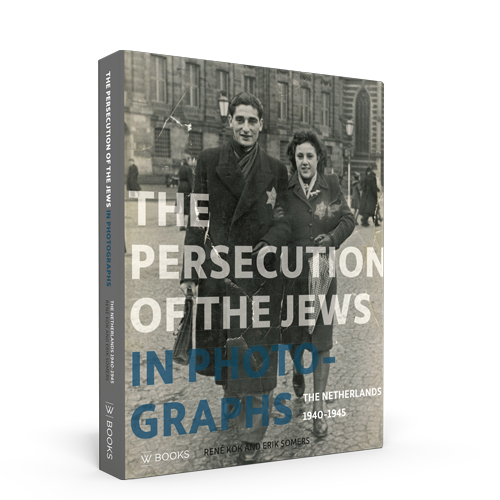 The Persecution of the Jews in Photographs, the Netherlands 1940-1945 is the first book of photographs about the persecution and deportation of the Jews in the Netherlands. A remarkable number of photographs have survived of the process from the initial isolation to the final extermination of the Jews. Both the professional photographers commissioned by the occupying forces, and amateurs, took moving photographs. Ordinary Dutch citizens recorded razzias, in some cases secretly. They also photographed the introduction of the Star of David, the Jews who went into hiding, and the role of perpetrators and bystanders. On 10 May 1940, the day of the German invasion, there were 140,000 Jewish inhabitants living in the Netherlands. In addition, there were more than 20,000 German-Jewish refugees in the country. The German occupying forces gradually introduced anti-Jewish measures, step by step. The first train left for the Westerbork transit camp on 14 July 1942, followed up by the deportations to the Auschwitz extermination camp. 107,000 Jews were deported from the Netherlands, The full extent of their terrible fate only became known after the war: at least 102,000 were murdered, died of mistreatment or were worked to death in the Nazi camps. This tragedy has had a profound effect on Dutch society. Photographic archives and private collections were consulted in the Netherlands and abroad. Extensive background data was researched, which means that the moving pictures have an even great force of expression. The result is an overwhelming collection of almost 400 photographs, accompanied by detailed captions. This book reflects the memory of the persecution of the Jews in photographs.